Lavishly illustrated with the artist's lithographs, drawings and personal photographs, Otis Oldfield Complete Lithographs is at once a comprehensive presentation of Oldfield's lithographic output as well as a portrait of the artist. Having unprecedented access to Oldfield's private diaries, the authors lead the reader through Oldfield's fascinating life from Sacramento, to Paris and back to San Francisco. 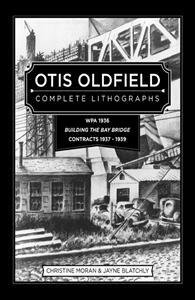 Commissioned by the WPA-FAP in the darkest days of the Great Depression, Oldfield created lithographs of the San Francisco-Oakland Bay Bridge as it was being built and North Beach, his surrounding neighborhood. Six Building the Bay Bridge prints were presented as personal gifts to President Franklin D. Roosevelt. Oldfield's dazzling versatility encompasses book binding and illustration to making ship models. His paintings, watercolors, drawings, lithographs, murals, portraits, landscapes and seascapes are breathtaking and collected widely. His friendships read like an art world who's who of the tumultuous mid-20th century. The artist was a professor at the California School of Fine Arts in San Francisco and later at the California College of Arts and Crafts in Oakland. Christine Moran has chronicled it all, combining culture and commerce with history and romance in a thoughtfully researched and well documented account of a premier 20th century artist. Jayne Blatchly has provided a wealth of graphic and historic materials from her all inclusive and extensive archive of the artist's life and work. Lavishly illustrated with the artist's lithographs, drawings and personal photographs, Otis Oldfield Complete Lithographs is at once a comprehensive presentation of Oldfield's lithographic output as well as a portrait of the artist. Having unprecedented access to Oldfield's private diaries, the authors lead the reader through Oldfield's fascinating life from Sacramento, to Paris and back to San Francisco.